JARVIS will send you the initial sign-up email which will navigate you to the sign-up screen. Fill out the required fields including your mobile phone number. You will receive an SMS providing you with a 6-digit code, please enter this into JARVIS and confirm. Here you'll see top like details including campaign names, number of flights, overall CTR and total budget. Each campaign displays Advertiser Name, Campaign Name, Salesperson and Campaign Schedule. The campaign provides an overview of Clicks, CTR, Actions, Campaign Budget, Campaign Progress and Impressions Progress. 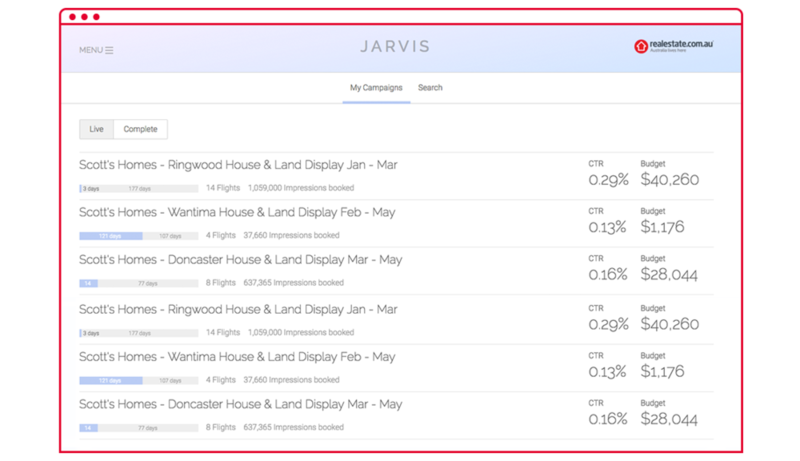 Click on each Flight to see the breakdown of metrics per creative to include Impressions, Clicks, CTR and Actions. If you click on one of the following tabs; Clicks, CTR, eCPC, Actions, eCPA or Delivered Cost, this will reorder the flights in either highest or lowest order per item you selected. To preview each individual advertisement with its performance data, simply expand the flight breakdown and click on a creative name to bring up the preview modal. JARVIS provides you with ongoing in-App support, simply engage with the conversation box which you will find in the bottom right corner of the application. If you have any questions about JARVIS or need some assistance speak directly to a JARVIS product specialist.